This website was set up to give new and expecting mothers a different slant on the various joys and hardships of breastfeeding babies, and some natural alternatives to help along the way. My name is Rebecca. I'm a practicing osteopath in Australia. This is a manual therapy which can be useful for many different complaints and I specialize in maternity, post-natal and child health. I work in conjunction with lactation consultants and it is because of this that I can see a need for advice to be available from a practitioner outside this profession. I work closely with mothers to help them understand how to most efficiently help themselves at home. I teach women how to massage engorged and inflamed breasts, how to massage their baby's abdomen for colic, several different burping techniques and most importantly how to look after their own posture so that they can continue to be strong and healthy for their baby. Breastfeeding babies can be a huge challenge for many mums. My own early breastfeeding experience was challenging, although due to the knowledge I gained through my working life I was able to avoid the need to be prescribed antibiotics. 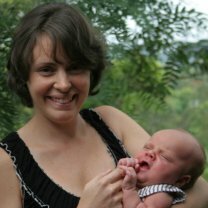 As this website matures, so too will my advice as I experience the realm of motherhood for myself and can give an even more personal insight into tips and tricks I find useful or irrelevant. I sincerely hope you find the information on this site useful and encouraging. My most important piece of advice, which I give to every mother that I treat, is to listen to and read various different advice, take what makes sense to you and leave the rest. My second most important piece of advice is to surround yourself with people who are supportive and who make you feel good. Every mother has an instinct for what is important and necessary for their child. This instinct can either blossom or be flattened by those around you, so choose the supportive and easy way and your experience will be all the better! The other overwhelming reason I chose to set up a website was so that I could use my knowledge to earn me a passive income so I could enjoy being a mother without the pressure of returning to work too early. I've used Solo Build It! to create this website. It has been an excellent experience. The online video demonstrations are excellent, the wealth of website and business building information is truly impressive. So, if you want to be a WAHM (work at home mom), I can honestly recommend you explore the possibilities that Solo Build It! can open up for you.